GRAFENWOEHR, Germany — The National Safety Council — a non-profit agency begun in 1912 — designated June as National Safety Month. 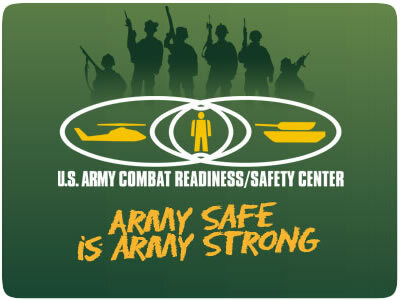 The U.S. Army has championed the effort by fully supporting the National Safety Council campaign. In addition to increasing awareness about safety hazards and how to prevent them, the campaign also draws attention to what tools Bavaria’s safety specialists can provide to the garrison’s leadership at all levels. The Garrison takes safety seriously whether host nation, soldier or DA & NAF Civilian. That’s one reason the Garrison Commander has designated 9 June a safety stand-down period from 0730-1130. Though front door services will not be affected the intent is for all employees and supervisors to conduct workplace inspections, review Job Hazard Analysis and perform specialized safety training during this time. The Garrison Commander will take time out of his busy schedule to visit some work-centers and talk with employees about safety in their work environment. The Deputy Garrison Managers at Hohenfels and Garmisch will do the same. Lear stated that “a safety program is only as strong as the support leadership provides, we are fortunate that USAG Bavaria Command leadership at all locations fully support the safety office, its’ initiatives and the program it manages”. Not only is the USAG Bavaria Safety Office focused on the workplace safety but also support the “Critical Days of Summer” which started 26 May and runs through 4 September. Lear stated “As the weather gets nicer, people get out and travel, riding their motorcycles, barbecuing and swimming. Unfortunately some take it to the extreme and the Army typically sees an increase in injuries and recreational and private motor vehicle fatalities”. He also emphasized that all rivers, lakes and ponds on post are deemed off-limits for swimmers. Also USAREUR does not authorize swimming in any lakes, ponds, rivers or pools off post unless there is a lifeguard always present. Fortunately the Safety Office has posted a listing of authorized swimming areas in the local communities for Garmisch, Hohenfels and Rose / Tower Barracks on the USAG Bavaria Safety’s website highlighted below. The Garrison also sends out to the community a weekly critical days of summer slide highlighting a summer related topic. PAO places the slide on the Garrison Facebook Page to make it available to anyone in the community. The garrison safety office offers a broad range of services and tools to anyone regardless if you are a tenant organization or located in Garmisch, Hohenfels or Rose / Tower Barracks. All this information and more can be found at the safety web page, http://www.bavaria.army.mil/directorates/safety.html or you can call Rose / Tower DSN 526-2303, CIV 09641-70-526-2303, Hohenfels DSN 466-2865, CIV 09472-83-2865, Garmisch DSN 440-3595 CIV 08821-750-3595.